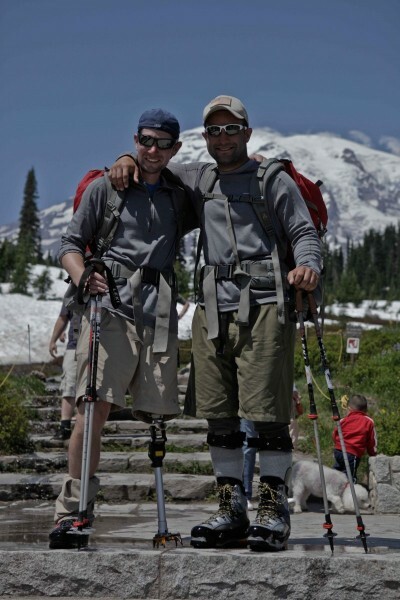 Tim and I summited Mt Rainier in July of this year with 2 men wounded in war. One had a prosthetic leg above the knee, the other, 2 carbon fiber braces supporting his legs that had been violently destroyed. They summited a 14,000 foot peak, whose average summit success rate is somewhere below 40. Not an easy challenge, let alone doing it with 1 leg. I had the opportunity to climb Rainier with Camp Patriot in 2010 during my first year working at Mystery Ranch. Mark Seacat had done it the past few years and since we became one of the main sponsors of the event, we continued to send guys to shoot photos and video of the summit attempt. There was a strong crew this year. Alongside the sturdy and determined Curtis Fawley and Art Rausch, were 2 inexhaustible guys from RMI and IMG, and the invincible Andy Politz to assist in the summit bid for our guests of honor. Capt. Victor A Munoz was born in Sebring, Florida on August 7, 1986. Raised in a military family, he moved around the United States until he graduated from Robert M Shoemaker High School in 2004 in Killeen, Texas. In 2008, he received a Bachelors in Science from the United States Military Academy in West Point, NY. Upon his commission into the Aviation branch as a Second Lieutenant, he went on to attend flight training at the United States Army Aviation Center of Excellence in Fort Rucker, Alabama. He is currently a rated Aviator in the Chinook CH47D Army helicopter. His first duty assignment was in Ansbach, Germany as a Platoon Leader in B/5-158 General Support Aviation Battalion, “Big Windy.” On March 4, 2011, he was involved in a severe motor vehicle accident with a local German national. After initially spending some time in Germany, he was evacuated to San Antonio, Texas to undergo further surgical treatment. Since that time, he has participated in the limb salvage physical therapy program at the Center for the Intrepid (CFI) at Fort Sam Houston, Texas. He wears an orthotic device on both legs called the Intrepid Dynamic Exoskeletal Orthosis (IDEO) which is designed and fabricated at the CFI for severely wounded service members. Recently, his medical evaluation board found him fit for duty and he plans to attend the Aviation Captains Career Course in September 2012. Sgt. Zeier was born and raised in Long Island, NY. He graduated early and enlisted in the United States Marine Corps at the age of 17. Zeier served with both the 2nd Reconnaissance Battalion and the 2nd Marine Special Operations Battalion based out of Camp Lejeune, NC. While on deployment, Sgt. Zeier’s vehicle was struck by an IED. As a result of the blast, Zeier suffered a TBI and the amputation of his left leg above the knee due to shrapnel wounds. Zeier is now retired from the Marine Corps and is a full time student at Columbia University. It was hot when Tim and I arrived in Ashford on Monday morning after the previous night’s opening ceremony in Seattle. Which by the way, was hosted by the Seahawks and showcased presentations by the one and only Billy Waugh (which if you haven’t heard of him, look him up) and the infamous General William G Boykin. 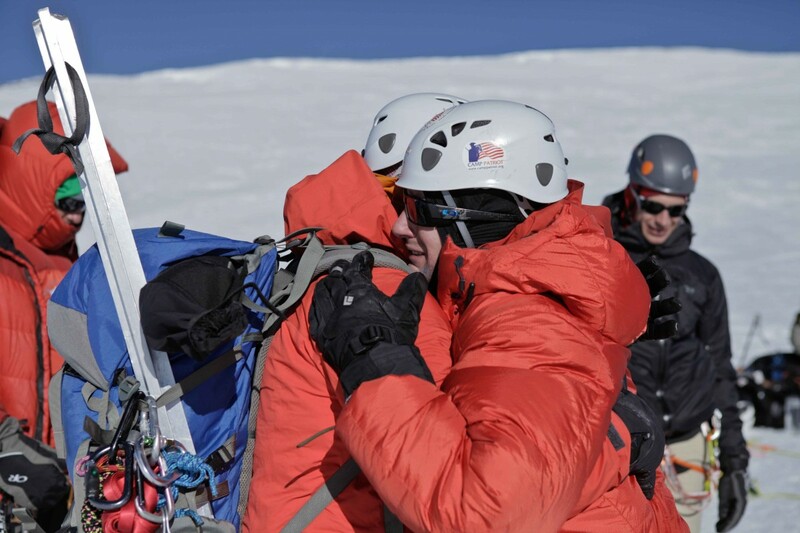 Both proud Americans and as honored as we to support Keith and Victor in their summit bid. We took the majority of Monday to get the team prepared, and on Tuesday morning, July 10th, we started our journey to the highest point in Washington. 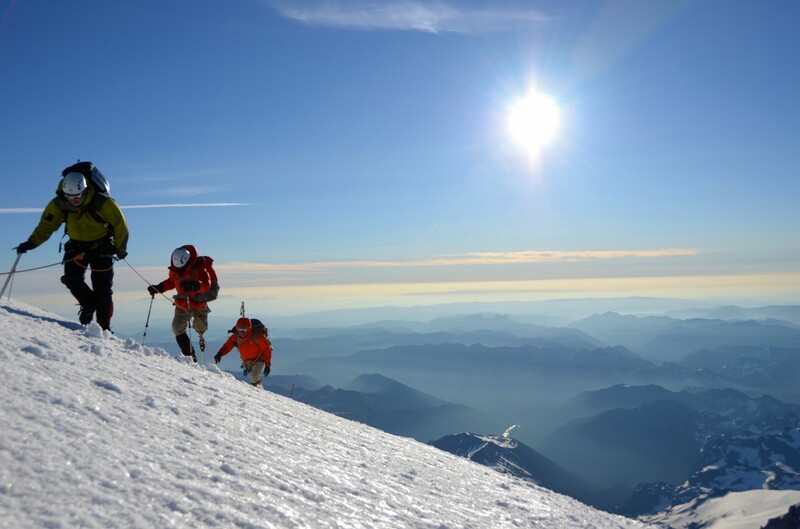 This will have been Victor and Keith’s first ever mountaineering trip. The weather in the Pacific Northwest during the entirety of our trip was flawless. 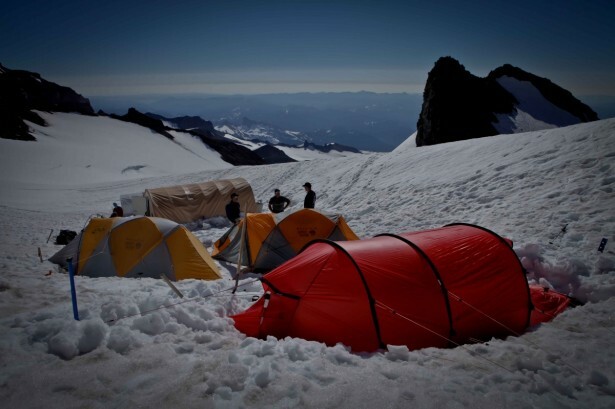 This gave us enough time to get to high camp at Camp Muir and spend a day doing some climbing and glacier travel techniques. 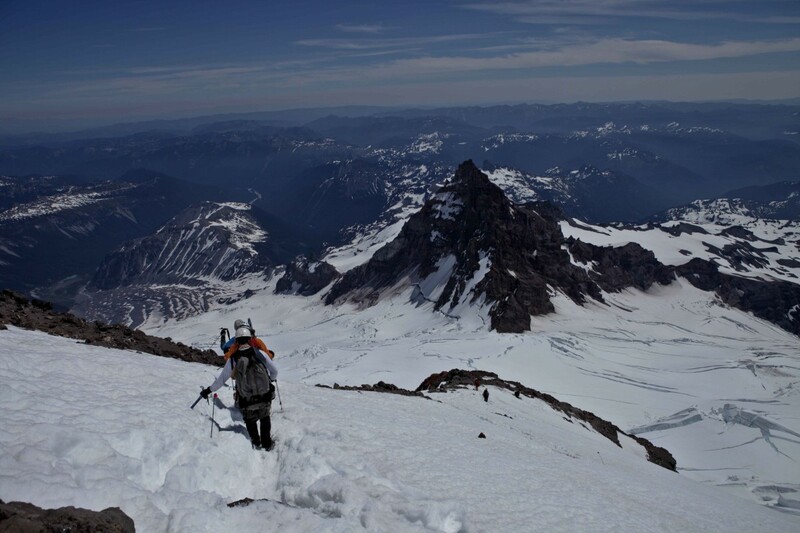 Rainier is legit; big approach, huge relief, and littered with deadly crevasses. 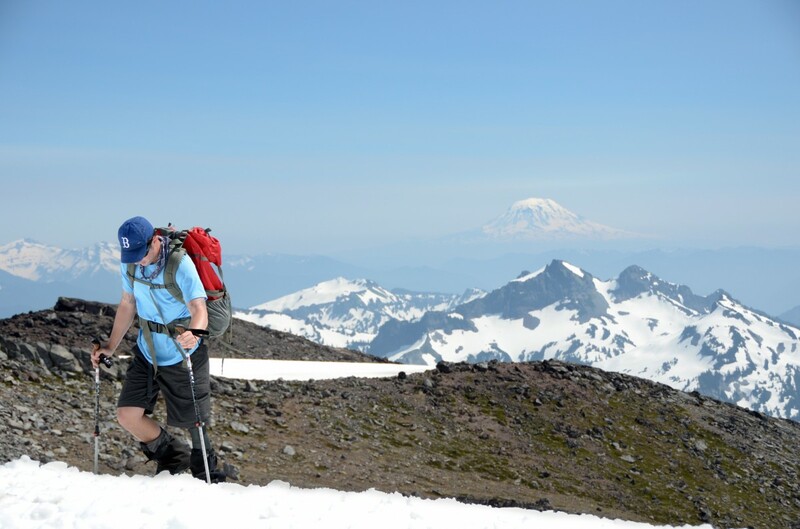 Neither for the weary nor arrogant, Rainier is a proud mountain, one for whom I have great admiration. Life at Muir is as good as it gets. Tim and I settled into Hotel Hilleberg and fortunate enough, IMG and AAI graciously donated their Space Station tents to our team, which gave us space to cook, hydrate and mentally prepare for the long climb that coming night. 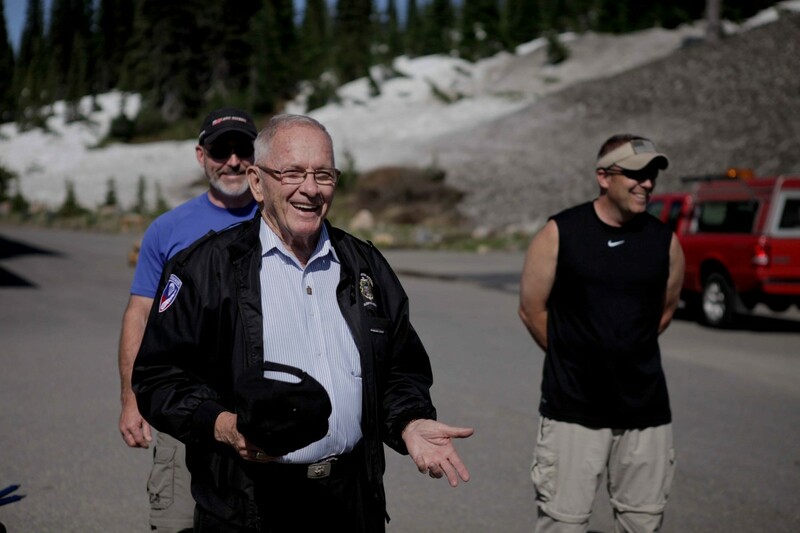 For Tim and me, spending time with veterans is an enormous honor. Helping them climb a mountain is an even greater one. I can only sit back and listen to the stories they have to share, and within those first few days, especially that time spent at Camp, they were flowing. Couple that with the dry, sharp and witty stories Politz was telling about medics on K2, running into Ed Veisters on the summit of Everest, and the realities of wearing plastic bags as clothing. We had become comrades, and the next 20 hours would prove it. 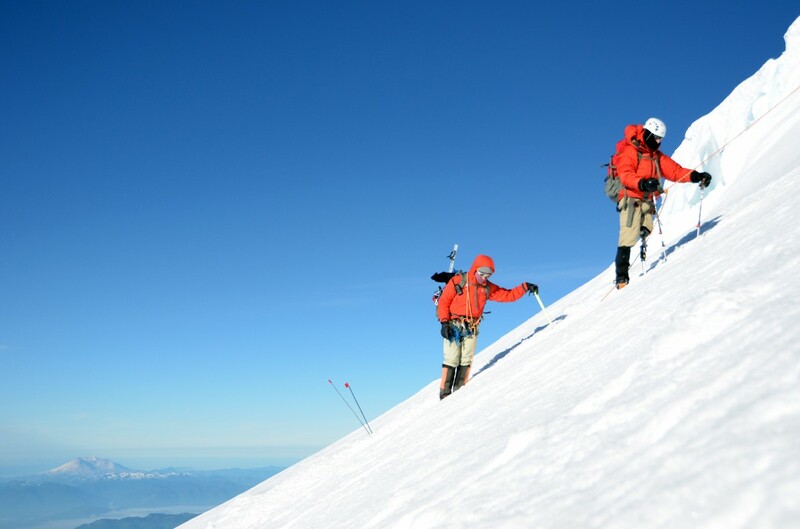 Throughout the entire ascent and descent, neither of these guys asked for help. Not with gear, nor terrain. Incredible showcase of determination and will power. We left camp at 10 o’clock at night and made it to the top of the Disappointment Cleaver around 3 am. By then it got cold. Numerous other teams gathered below the upper snowfields, and we got in line for our final push to the summit. 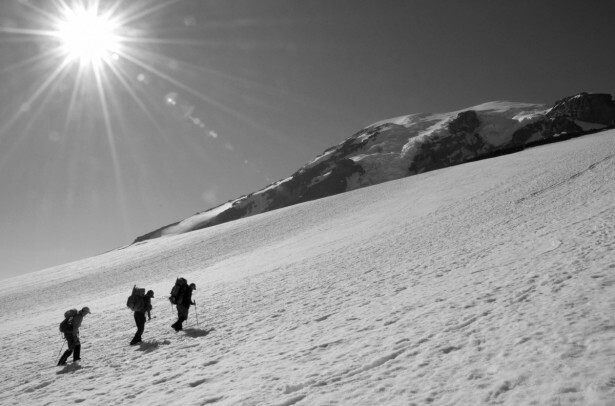 Keith and Victor, despite their injuries, pioneered their way up that massive snowfield, in and around crevasses, and without a single doubt took the final steps to the summit. 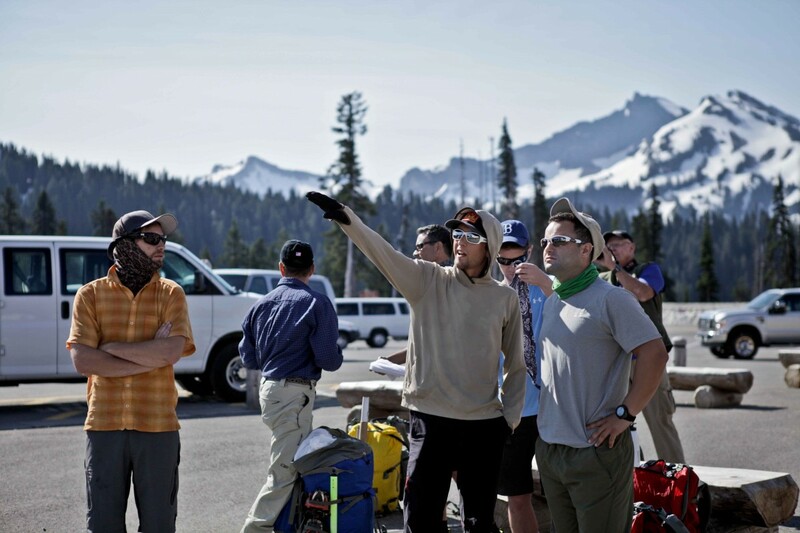 Near 9 am, on July 12th, the 9 of us were greeted with applause from various other teams, as we crested into the summit crater of Mt Rainier. 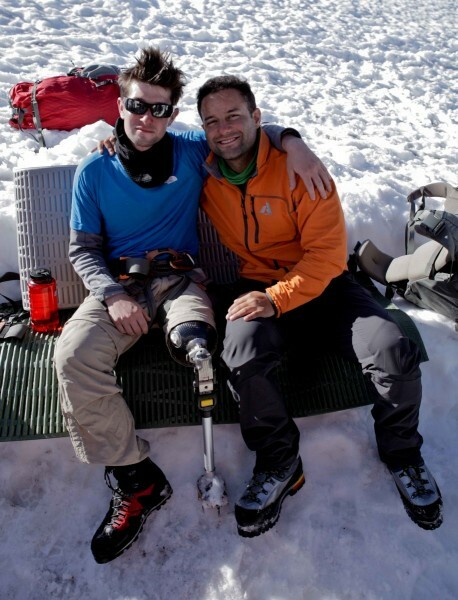 Victor and Keith, determined to succeed, had completed their first major climb having been wounded from war, and they celebrated. It was an emotional scene up there, grown men crying from accomplishment. Myself included. This was, however, only the halfway point. We still had to get down and the sun was beginning to soften up the surface snow on those massive upper snowfields. We began our decent. Our last maintenance break, as Curtis likes to call them, came on the Flats just above Muir. 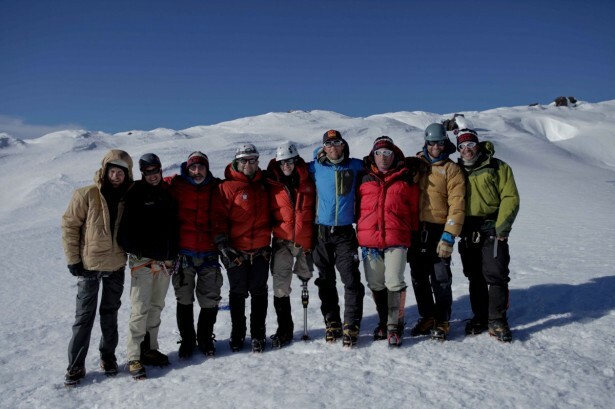 Two days ago, one day even, we might have been talking glacier travel, hydration, nutrition, proper clothing. Instead, we laughed at bad jokes, the way old friends do. It was 5 pm by the time we saw Muir again, and by the time we settled back into camp, it had been well over 20 hours since we’d begun climbing. We slept. The next morning we began our descent back to Paradise and home. The benign terrain down from Muir leads to grassy meadows, creeks and increasing populations of photographing tourists taking a walk from the National Park entrance. I could hear the applause before I saw the crowd. Paradise erupted when we arrived. Dozens had gathered to witness our return, led by Keith and Victor. 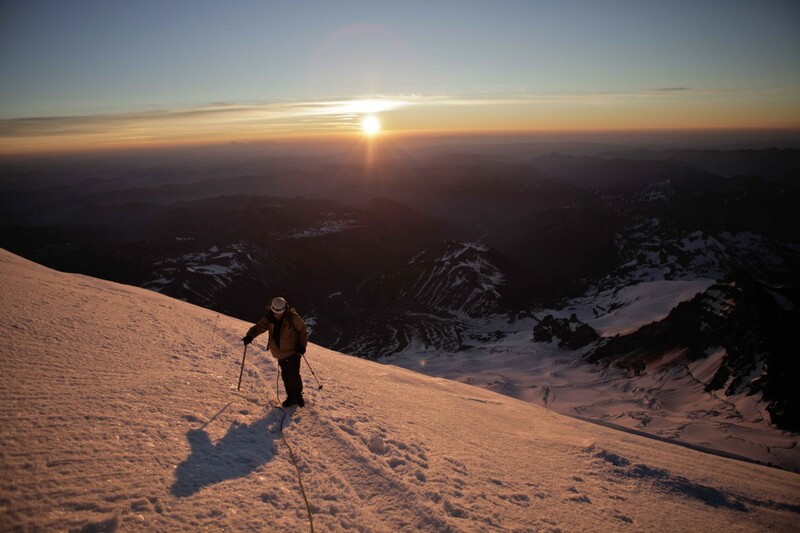 5 years in a row Camp Patriot has been successful in summiting Rainier. This was their 6th: their flawless record intact. As we descended back to Ashford for the ceremony, the bus eventually fell silent. Exhaustion, and the bittersweet feeling of an epic adventure coming to an end, began to become a reality. Everyone at the ceremony could feel how important this had been, how much more meaningful than another, more standard brand of expedition. 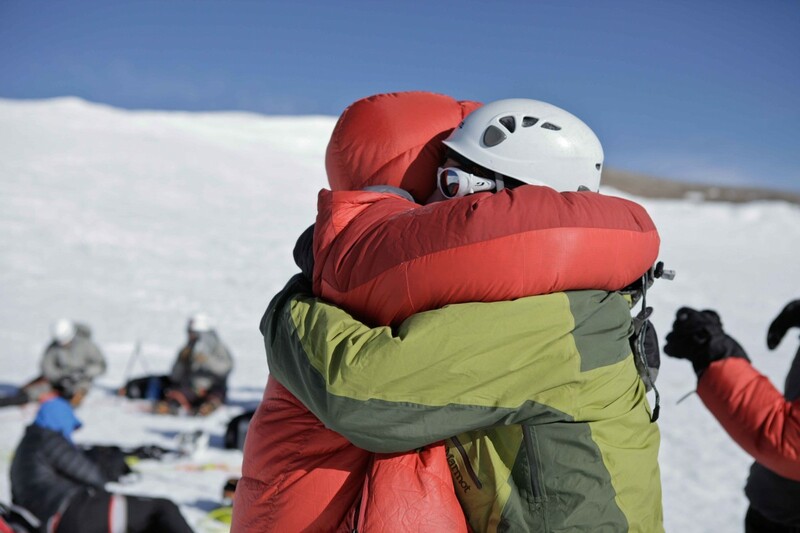 The strength of those two guys’ spirit up on that mountain is secured in Tim’s memory, and mine, forever. Congratulations Victor and Keith. 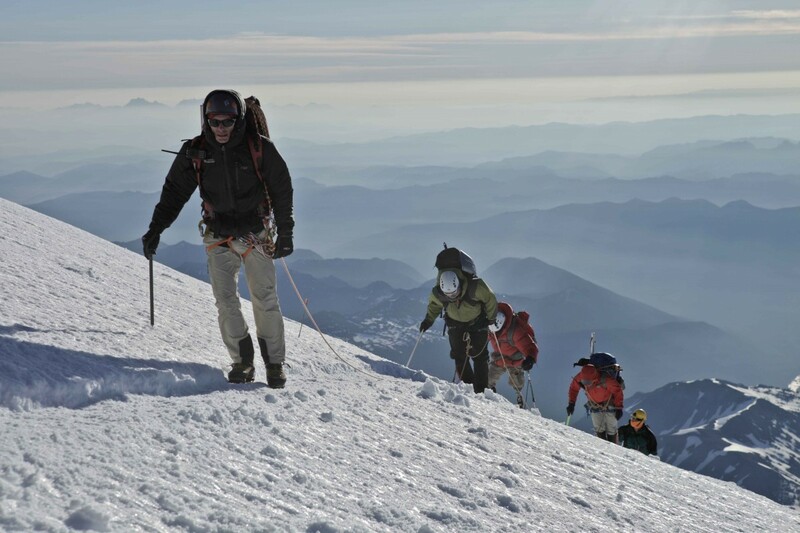 Your determination, your optimism, your work on the mountain, all inspire me. Thank you for your service to our country, your appetite for adventure, and most of all, your friendship.